​"Sewing Seeds of Faith - Harvesting Spiritual Rewards"
Join us this Easter (April 1st) for our 4th annual Easter in the Park. 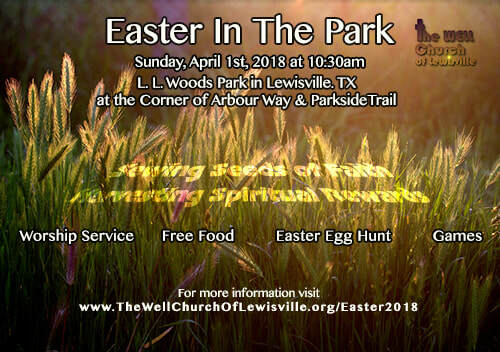 The Well Church of Lewisville will hold an Easter worship service, provide lunch, and host an Easter Egg Hunt. This is open to the public. Please come join us for this time of celebration and family fun! ​We will be at the pavilion off of Arbor Way near the large parking lot.